Pulaski Heights United Methodist Church in Little Rock will present the 2019 Raney Lecture Series, beginning Friday. It will feature the Rev. Dr. Sam Wells, Vicar of St. Martin-in-the-Fields, from London, England. 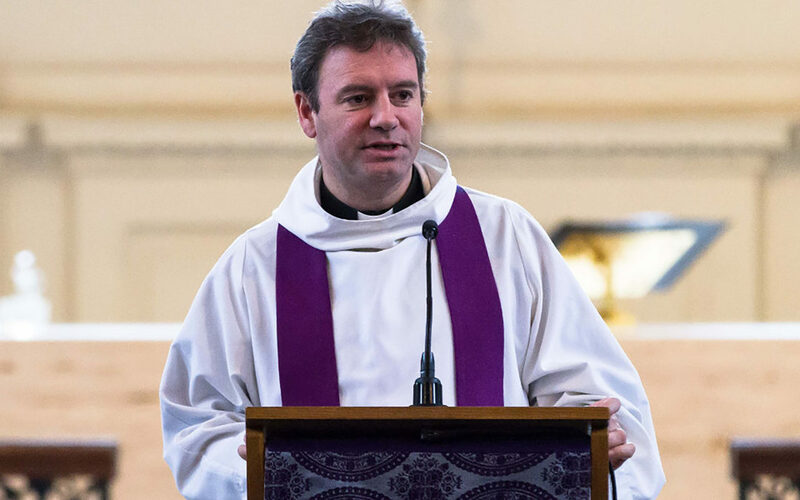 Wells has served as a Church of England parish priest for 20 years. He also spent seven years in North Carolina, where he was Dean of Duke University Chapel. But this is his first time in the state of Arkansas. Saturday’s and Sunday’s events will feature live performances from St. Martin’s Voices, which is made up of past and present choral scholars. 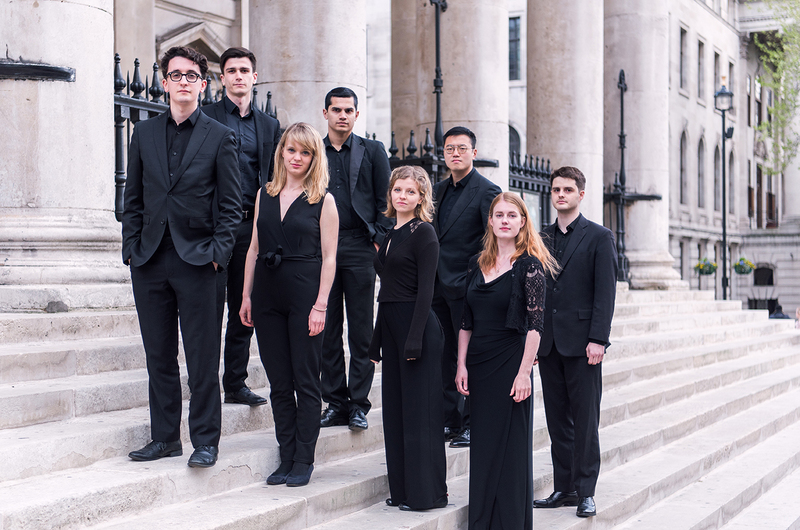 Recent performances have included Mozart Requiem and Vaughan Williams Serenade to Music with the Academy of St. Martin-in-the-Fields, and Beethoven Mass in C with Southbank Sinfonia. Andrew Earis is the director of music at St. Martin-in-the-Fields. On Saturday, there will be a luncheon following the 11 a.m. worship service in Wesley Hall as well as a concert later that evening, beginning at 7 p.m. with the St. Martin’s Voices. Both events are free to the public, but FUMC senior pastor Britt Skarda said guests must register for the luncheon. Deadline to register is Thursday. For more information, contact the church at (501) 664-3600 or online at phumc.com/raney. Skarda said there were already more than 200 guests registered for the luncheon. “This is one of our oldest lecture series, I believe it began in 1951 and has been an annual event,” Skarda said. Wells said he got into ministry because he wanted to be with people as they faced the most difficult things in their lives in the light of faith. It’s a new day, but deep pain lingers from what occurred in the United Methodist Church yesterday. It’s a new day, but the anger so many are feeling has not dissipated. It’s a new day, but the exclusion LGBTQIA persons are experiencing from their church feels like a crushing weight. It’s a new day, but the fact of the matter is the United Methodist Church is deeply wounded. This is the reality we face today. Not the reality of what we would like things to be, but the reality of the way they are. It is the reality we must begin to address. It will be hard, involve a great deal of prayer and hard conversations, and must be grounded in grace. Perhaps most of all, it means we must seek a new way forward that breaks the ‘winners and losers’ cycle of polarization that has captured our collective soul. So here is our work. We must reach out in love to those who are hurting the most and welcome them into our hearts. We must care for each other, especially when that is difficult. And we must begin to talk about how we can find unity – even if it is a brand new kind of unity – in a broken church with broken people. Come Holy Spirit. 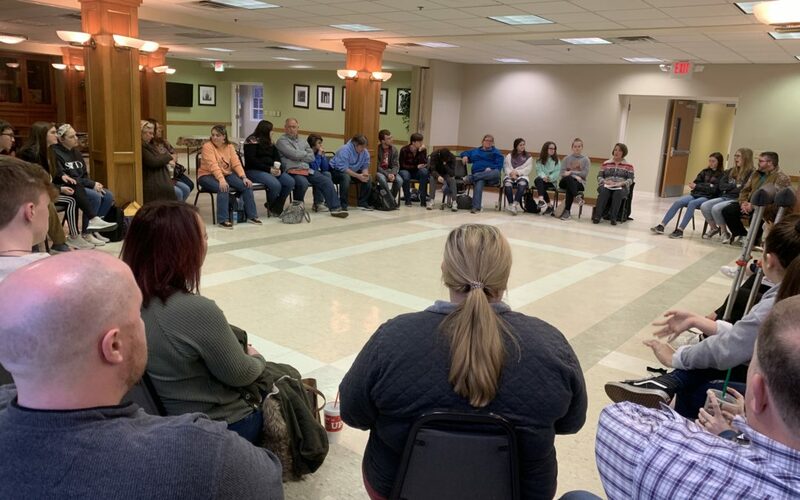 At a recent ACCYM meeting, Arkansas Conference youth and young adults took a vote on the plans proposed by the Commission on a Way Forward, as well as the two additional plans; The Simple Plan and the Modified Traditional Plan. The ACCYM Youth voted after a presentation by Karon Mann on the five plans that will be discussed at General Conference in St. Louis this February. They decided to use a similar process to the one used for the Global Young People’s Convocation (GYPC). They voted for the plan they felt best represented themselves, and the results are listed below. Current ACCYM President John Mark Mathis was present at the vote and wished to share his thoughts on General Conference and his hope for the future United Methodist Church. A letter from Mathis is featured below. As a current senior, my life is about to change forever as I go out and explore what adulthood has in store for me. One thing that has been consistent is the time I spend in church, and specifically, the Methodist Church. The Way Forward and the current decision is a scary thing. Not only does this affect the church’s current generation, but it will also impact the younger generation and generations after. As a youth, I love to learn more, and I have been able to learn more about The Way Forward and all the plans in place. We have talked about it in our local youth group, but I learned most of my current knowledge at our ACCYM meeting when Karon Mann spoke to youth and adults alike and gave us a deeper understanding on the plans for the upcoming General Conference. Karon gave us a more precise explanation of the plans and was able to answer any questions my peers or I had. It was an excellent opportunity to dig in. No matter what happens, I believe that God will still move so powerfully in the United Methodist Church, as well as the world. The final day of the Special Session of General Conference brought relief for some and grief for many others. The Traditional Plan (except for Petitions 90041 and 90048) passed the plenary session with a final vote of 438 (53.28 percent) in favor and 384 (46.72 percent) against. On the previous day, a motion was made to request that the Judicial Council review all of the petitions which were passed through the legislative committee and declare whether these petitions were constitutional. That Judicial Council decision, number 1377, found the following petitions in the Traditional Plan to be unconstitutional: 90033, 90034, 90035, 90037, 90038, 90039, 90040, and the second sentence of 90045. The two disaffiliation petitions, Disaffiliation – Boyette (90059) and Disaffiliation – Taylor (90066), were also found to be unconstitutional. But The One Church Plan failed to pass once again by a vote of 374 (45.44 percent) to 449 (54.56 percent). With the deadline for the end of General Conference rapidly approaching, the delegates voted to adopt and pass a minority report for one of the disaffiliation plans related to Disaffiliation – Boyette, as well as move to reject all other remaining petitions on the calendar. The Rev. Timothy Bruster of Central Texas also made a motion to request a final declaratory decision by the Judicial Council on the constitutionality of the Traditional Plan. That request will be addressed at the next Judicial Council meeting April 23 – 25. During the debate over the minority report, West Ohio Conference delegate Lyndsey Stearns brought before the delegation a statement of unity from more than 15,529 young people. The statement said that not all young people are of the same mind regarding LGBTQ people, but have found commonality through worship, sharing each other’s stories and experiences, and seeing each other’s gifts and fruits for ministry. A group of young Arkansans, ranging from high school to college age, traveled to St. Louis this week to watch the discussions happening at General Conference. Grace Rogers, a senior at Hendrix College in Conway, organized the group of students to travel to St. Louis. She said she felt it was important because the church isn’t the church of tomorrow for youth; it’s the church of today. Other students came to General Conference because they grew up in the church and wanted to know which direction the denomination was choosing to move toward in the future. For Rymel, watching the debates and protests happening on the floor of the delegation has not been an easy thing to do. But she said despite all of this, she still has hope for the future of the church. 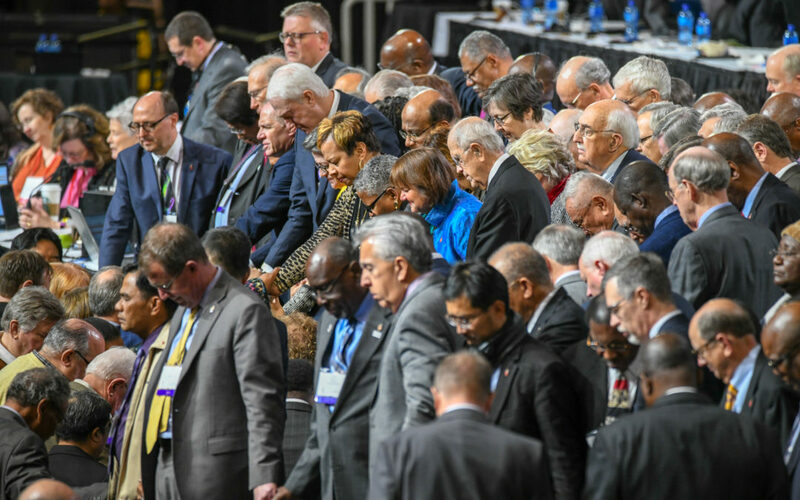 At the end of the day, Bishop Gary Mueller offered a statement of unity for the Arkansas Conference and the global United Methodist Church. You can hear his statement by viewing the video below.